Time to start a new stranded project and I've been searching for a panel type (vertical) instead of horizontal bands. There are some excellent examples of knit designs on Ravelry plus I've been pulling out all the design books and magazines for ideas. I want a pullover but one where I can hopefully create a modified set in instead of a drop shoulder. Don't need all that bulk under my arms as I'm feeling shorter all the time. Here is one I'm previewing since I'm trying to use stash and not buy one single solitary skein of yarn for this. The larger photo in the book does not look quite as horizontal stripe. 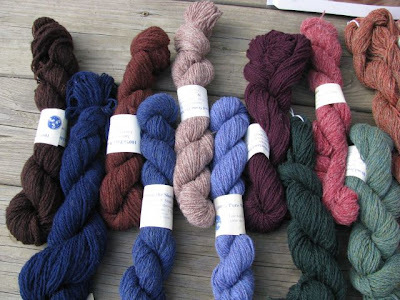 Recently all the skeins and balls of Jamieson & Smith, Jamieson and Harrisville in two ply jumper weight were laid out on the floor and sorted by color. I kept one skein of each color out and put those in a canvas box like you would for a box of crayons. 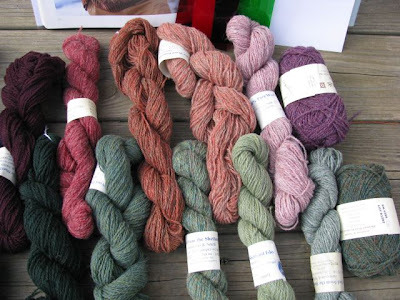 Easier to see the colors this way rather than have to sort through tubs of yarn looking for similar blues for example. 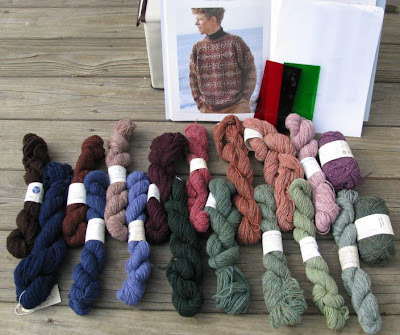 One of the better examples of a stranded work that looks vertical is "Whalsay Jumper" out of Ann Feitelson's "The Art of Fair Isle Knitting - History, Technique, Color & Patterns". When I first bought this book, this sweater was among the ones I liked the most and I had collected the browns, tans and peachy/lavender colors for it. Even though my hair is getting grayer all the time, it's basically brown and I would have washed out in this sweater. It calls for J&S in these colors. The color names are Feitelson's but they give an idea of what the color looks like. Had all in stash except for 1281 and FC45 but, with help of the color card, came fairly close with FC50 and 78. Here are my substitutions in J&S but in the green and blue color ways rather than the brown and orange-purple. These color names are mine for description purposes. The top row in each color is the original called for, the bottom row is the substitution. Since I'm also a quilter I had a set of the red and green colored squares to look through. These take out the color and leaves just intensity (darkness/lightness). These colors match up quite well in intensity. Since my favorite colors are blues and greens, this just might work. I like the blues and greens, though some of them look gray to me. Looking at the small photo of the original sweater in Feitelson's book, I think it has a kind of hearts-and-flowers appearance. I may play with graph paper tonight. Thanks for reminding me of it.